Some sources list the Berylline as an accidental species, since its members apparently do not breed regularly in the US. Average weight: male 4.87 g, female 4.37 g.
Adult male: Emerald green all over, with purple on the rump and on some wing and tail feathers. The gorget is brighter green than the back. 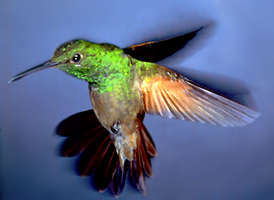 Adult female: Similar to the male. Observed (rarely) in the Chiricahua Mountains of southeast Arizona, and in New Mexico. Winters in Mexico.